"POWERFUL. . .GODWIN IS BRILLIANT. . .DEFTLY PLOTTED AND IMAGINED. . . [It] deepened my long-cherished belief about certain forms of art: that in exploring extremities of human behavior, in forcing us to wade through real or metaphorical blood, such art saves us from these experiences and is cathartic in the best sense of the term." Francesca married her husband Cameron, an ambitious Los Angeles district attorney, because he asked. Beautiful and pampered, she has never worked and has never wanted to. She lives only to appreciate the finer things and to be adored. But after four years of marriage, she finds herself unable to move, to dress in the morning, or to take the elevator outside. Lately, she finds her days drifting by in a haze. She'd like to leave Cameron, but the effort seems too great. Instead, she visits her mother, once her closest confidante, now indifferent and distant. As Francesca prays for rescue, change makes a surprise appearance, and suddenly she is faced with the choice between an awkward life and a slow, comfortable death. . . .
"Deceptively subtle: it would be easy to skim right over all the deep things the author is saying and read her book as a well-written surface story of a beautiful woman who makes an abortive bid for freedom....I have been crying out for contemporary woman's new consciousness to express or define itself in a good novel....Here it is: Glass People by Gail Godwin." 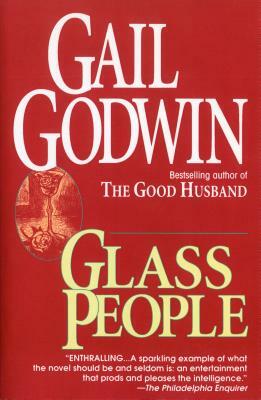 Gail Godwin is a three-time National Book Award finalist and the bestselling author of twelve critically acclaimed novels, including A Mother and Two Daughters, Violet Clay, Father Melancholy’s Daughter, Evensong, The Good Husband, Queen of the Underworld, and Unfinished Desires. She is also the author of The Making of a Writer: Journals, 1961–1963 and The Making of a Writer, Volume 2: Journals, 1963–1969, edited by Rob Neufeld. She has received a Guggenheim Fellowship, National Endowment for the Arts grants for both fiction and libretto writing, and the Award in Literature from the American Academy of Arts and Letters. She has written libretti for ten musical works with the composer Robert Starer. Gail Godwin lives in Woodstock, New York.